As a director, Ken Russell always has been a mixed bag to me. To say that he had a tendency to go over-the-top would be an understatement and I found very few of his films satisfying as a whole though he did produce many fine performances in his films even if the films themselves were so-so. Glenda Jackson (who won her first her Oscar), Alan Bates and Oliver Reed in his adaptation of D.H. Lawrence's Women in Love; Twiggy in the musical The Boy Friend (perhaps his most enjoyable and mainstream outing); the spectacle of Tommy bringing the landmark album by The Who to cinematic life with its eclectic cast including Oscar-nominee Ann-Margret as the deaf-dumb-and-blind boy's mom (covered in beans at one point), a brief bit by Jack Nicholson as The Specialist, Tina Turner's Acid Queen and the band's late drummer Keith Moon as Uncle Ernie, to name but a few; William Hurt's experimentations with mind-altering drugs and isolation chambers to a devolved consciousness in Altered States, based ion the novel by Paddy Chayefsky who wrote the screenplay as well, but hated the film so much that he disowned it and the film credits the script to his given first and middle name, Sidney Aaron; and the loony Crimes of Passion which contains a brave but great Kathleen Turner performance. 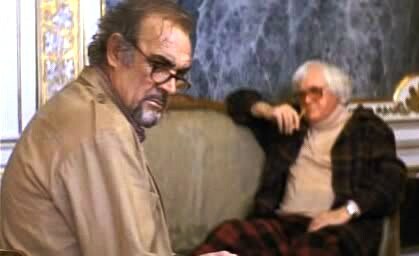 However, what I remember the most about Russell was one of his many performances as an actor (check out his filmography), particularly his supporting role as Walter in Tom Stoppard's adaptation of John Le Carre's The Russia House starring Sean Connery and Michelle Pfeiffer, an incredibly underrated Fred Schepisi film from 1990. Russell gave an entertaining and compelling turn in his rather small role. For someone whose reputation mainly is that of a director, surprisingly, that might be what I remember about him most. To read the full New York Times obit, click here. Ken Russell would get a lifetime/eternal afterlife pass from me if The Devils had been his sole contribution to cinema. I quite enjoy the over-the-top, "imperfect" filmmakers these days.